Four whole eggfruits, golden yellow like heart-shaped school buses, ready to be made into smoothies, pies, salad garnishes and more! Eggfruit range in size from apple to grapefruit. These are grapefruit sized. Eggfruit is a versatile Caribbean fruit that can be eaten raw or cooked, sweet or savory in many recipes. 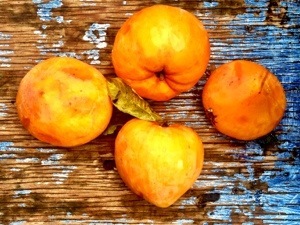 It grows on an attractive mid-sized tree in the Sapote family, with dark green foliage. Eggfruit is known by many other names, including canistel and yellow sapote, and the latin name of the tree is Pouteria campechiana (Morton, J. 1987. Canistel. p. 402–405. In: Fruits of warm climates. Julia F. Morton, Miami, FL.). The thin, delicate skin of the fruit contains latex sap, so generally the peel is discarded. The flesh of the eggfruit is high in niacin, carotene (provitamin A), ascorbic acid (vitamin C), calcium and phosphorous. Three to four large, smooth, dark seeds are enclosed in the flesh of the eggfruit. The texture and color of the eggfruit’s flesh is oddly similar to the yolk of a hard boiled egg. It is dry, not juicy, despite the 60% water content of the eggfruit. The flavor is rich as, but much sweeter than, an egg yolk. The taste is not dissimilar to a baked sweet potato, but more delicate. Eggfruit can be eaten out of hand, baked, puréed, crumbled over a salad, added to dressings, enjoyed sweetened, or salted with vinegar. Eggfruit is wonderful in smoothies. It makes a yellow egg-custard flavored milkshake when blended with ice, milk, a dash of vanilla or nutmeg, and a small amount of sweetener. Mrs. Powell at the La Reine Farmer’s Market on St. Croix makes a wonderful eggfruit drink. I use eggfruit as a substitute for canned pumpkin in pies, adding a bit of liquid if needed to approximate the texture of puréed pumpkin. The mashed eggfruit flesh thickens and enriches mixtures, so use your imagination! A squeeze of lime juice also heightens the flavor. See my recipe for eggfruit pie below. Eggfruit is fragile once it is ripe, so it’s not a fruit you’ll readily find in places outside of the Caribbean and southern Florida. Keep it in the fridge after it ripens, and enjoy this rare treat! Pie crust of your choosing – you can use small tart crusts too! Reserving toppings, mix all ingredients in a blender. Pour into a pre-baked crust(s). Sprinkle nuts, or shredded coconut, or both, on top if desired. Any leftover filling can be poured into a buttered oven-safe casserole or dish and will make a yummy little custard. Bake in a medium oven, for 1 hour or until the edges have set, at 250º F.
We made this with molasses once – it was a bit too heavy for most of the family’s liking, but with adjustment that might be a good alternative sweetener for this recipe too! For more recipes, check out eggfruit.com! If all this seems overwhelming, make reservations: Chef Dave Kendrick of Kendrick’s Restaurant in Christiansted stopped by the farm today to pick up some greens and took a couple of eggfruit with him. He’s planning a special dish with eggfruit in it, so stop by and see what he’s come up with! For reservations at Kendrick’s call (340)773-9199. Combine all ingredients in a blender at high speed. Add ice and blend briefly to crack, pour in tall glasses and enjoy. I have left off 1/4 teaspoon nutmeg from the previous recipe. sorry!! The pie does sound yummy, but if you want to enjoy the custard-y filling and save some calories, just make the filling and bake as individual custards, with the toppings of choice and maybe a bit of whipped cream.